"I was looking for something easy and tasty to make with the remaining ingredients in my apartment and this is what I came up with." 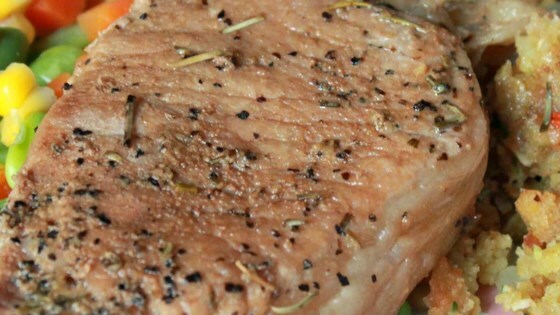 In a small bowl, combine rosemary, ground pepper, and salt; rub rosemary mixture on pork chops. Melt butter in a large skillet over medium-high heat; stir the garlic into the melted butter, then place the pork chops in the skillet. Cook the pork chops 3 to 5 minutes per side, or until golden brown. Turn the heat down to low, pour in the beef broth, and simmer for 35 to 45 minutes, or until pork chops are fully cooked and meat thermometer inserted into thickest chop reads 145 degrees F (63 degrees C). I thought this was pretty good. I think I didn't leave the pork chops on long enough because they were a bit tough. However, the actual recipe was good and simple. I will try it again. This recipe is delicious! Instead of combining the salt, pepper, and rosemary in one bowl, I sprinkled the chops individually so that the ingredients were evenly distributed. Tasty. I did add some onion powder, that was all. This smelled SO good while it was cooking. Very simple. I'd use this again. So delicious! I doubled the recipe and added a can of cream of mushroom soup to thicken the broth a bit and it came out wonderfully. A new family favorite! My whole family enjoyed these. I didn't change the recipe at all and it was wonderful. This was a pretty good recipe. I used fresh rosemary instead of the dry and simmered the chops for 1 hour. We will have this again. This was very easy to make and yummy. I added way more broth than what was called for by accident so when I took the chops out i added flour and made a gravy for my mashed potatoes, Mmmm!